DC Flatliner Pinstriping Brush series 1310 has a unique squirrel hair comes from China and it is softer than the traditional Siverian squirrel hair. Its the same hair that Mack Brush uses in their #10 Origianl Mack Striping brush which is a "work horse" that was designed for long lines. 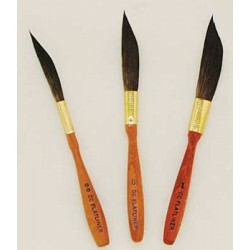 The DC Flatliner Pinstriping Brush series 1310 is a very "fast" brush and lays out Long lines. Available in size 00 hair out 1-5/8", size 0 hair out 1-3/4", and size 1 hair out 1-7/8". I see the DC Flatliner Pinstriping Brush series 1310 more of a medium size pinstriping brush (in hair) and good for fine-medium size lines 3'-4' long depending on the load of paint. The Mack brush 1010 has a longer body of hair before the belly of the pinstriping brush, making it posible to cary a larger load for longer lines if you need. Although I think the DC Flatliner Pinstriping Brush series 1310 is one of the brushes that will perform like a traditional Sword pinstriping brush, while offering those the feel of a Dagger pinstriping brush. DC Flatliner Pinstriping Brush Size 0 Series-1310 Mack Brush Series 1310 - Size 0 DC Flatliner Sword Striper Brush Hair Length Out - 1..
DC Flatliner Pinstriping Brush Size 00 Series-1310 Mack Brush Series 1310 - Size 00 DC Flatliner Sword Striper Brush Hair Length Out -..
DC Flatliner Pinstriping Brush Size 1 Series-1310 Mack Brush Series 1310 - Size 1 DC Flatliner Sword Striper Brush Hair Length Out - 1-7/8"&..